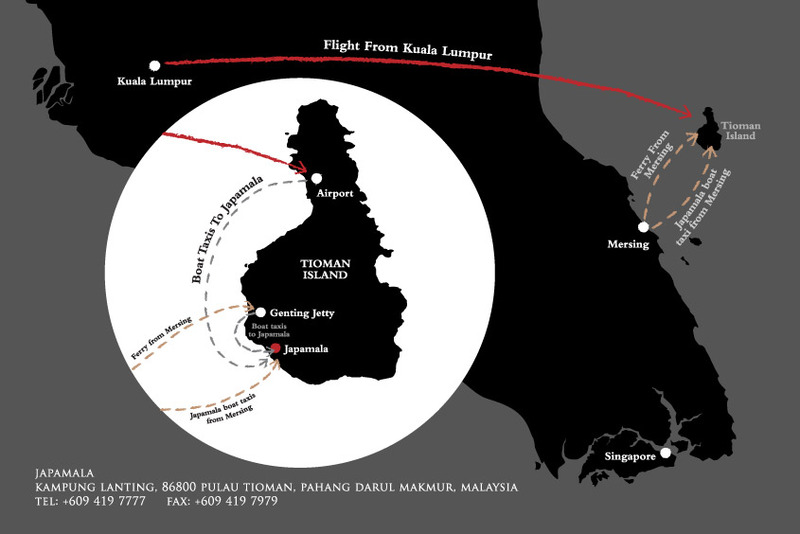 To enter Tioman Island, a Marine Conservation Fee of RM 30 nett per person is applicable. The fees go towards a trust fund, which is used to manage and conserve the park. We offer land transfers and private car transfers between Mersing Jetty, Kuala Lumpur and Singapore. Japamala Resort is located about two hours away from Mersing jetty by public ferry. Your experience begins even before you arrive at Japamala. Enjoy a mid-morning coffee stop enroute to Mersing or a scenic picnic with a wine and cheese basket on your way back. If you are returning to Kuala Lumpur, you can look forward to a stop at the UNESCO World Heritage Site of Malacca for a dose of history and heritage. Guests returning to Singapore will have the option of stopping at brand factory outlets in Johor for a spot of shopping. 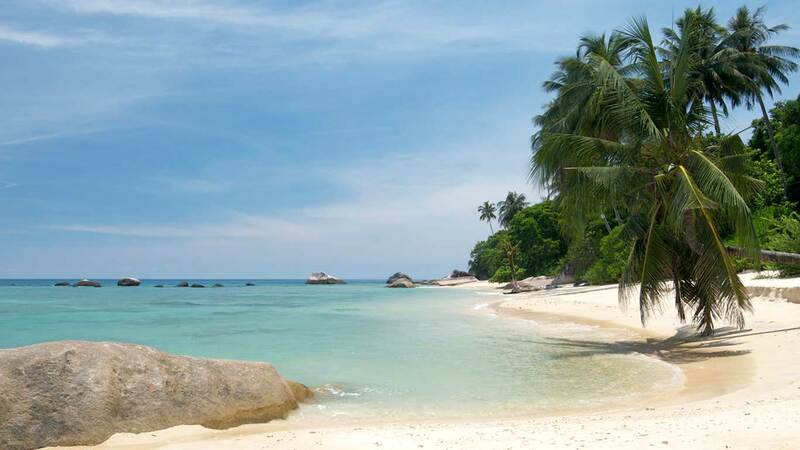 An overland transfer from Villa Samadhi Kuala Lumpur to Mersing is available at RM1,150 nett per couple per way. A maximum of 2 couples in a land transfer. An overland transfer from Villa Samadhi Singapore to Mersing is available at SGD395 nett per couple per way. A maximum of 2 couples in a land transfer. *Japamala speedboat transfer is currently unavailable until further notice. Please take note that a liability and release form will have to be signed prior to boarding the vehicles. Japamala speedboat transfer is currently unavailable until further notice. Due to limited seats available, please make your bookings at least 3 business days in advance to avoid disappointment. The above transfer charges are valid until 31st October 2018. The Management of Japamala reserves the right to make changes on the charges without any prior notice. Please also be advised that should any stays during the Malaysian monsoon season be cancelled or unused due to the disruption of the ferry schedule or other transport services, there shall be no refund of payment made to us. Kindly visit www.tiomanferryticket.com / www.easybook.com if you wish to take the ferry to Tioman Island. For ferry services from Tanjung Gemok you may visit www.cataferry.com. As guests cannot be ferried to Japamala directly, please alight at Genting village. From there, we provide boat transfers from Genting Village to Japamala at a fee of RM30 + 6% GST per person per way (including childern aged 5 years old and above). Please make your booking in advance. Resort boat transfer are not obligatory and there are local boat taxis available at the jetty. We would like advise our guests that these local boats they may not have licences and insurance coverage, and the resort does not assume any responsibility if guests wish to use this mode of transfer. At any time should there be cancellation of ferry / speedboat service from Mersing, hence causing a situation of being stranded at point of departure to Tioman. Japamala Resort shall not be held responsible for such predicament therefore will not refund any payment made earlier for booking of rooms. Tioman is a relatively undeveloped island - getting around is done mostly by trekking or by sea taxi. Japamala Resort has its own boat which is available for hire on an hourly or per day. There is a rough road between Tekek and Juara - on the East side of the Island - local operators will drive you there for approximately RM35 one way. For guests who wish to extend their stay or proceed to other destinations within Malaysia, optional mainland tours and holiday packages can also be arranged on your behalf. Please check with our front office.